Few suggestions for a weekend trip from Calgary to Drumheller and Dinosaur Provincial Park. The trip may be planned as day trips by avoiding the overnight stay and dividing it as two separate trips from Calgary. Check the visiting hours as summer hours are much longer than winter hours. Some facilities are closed in winter. If you are travelling from Edmonton: Edmonton to Drumheller is 3 hours ~ 280 km from downtown Edmonton. Adjust initial travelling time accordingly. Check road conditions from AMA road reports. Ideally three Day/ two nights. This trip can be done in two days/ one night. A. Day 1- Calgary to Drumheller - 135 km. Start from Calgary so as to reach Drumheller by around 9:00 am. Go to the visitor centre, where the World’s Largest Dinosaur is located. 1 Avenue West, Drumheller, Alberta. Then visit the Royal Royal Tyrrell Museum, which is ~ 7km from downtown. 1500 North Dinosaur Trail, Drumheller, Alberta T0J 0Y0. Need around 2 hours here. Drive east on AB-9 towards Drumheller (135km) and do the scenic 48km circular route (do it counterclockwise) called Dinosaur Trail on Highway 838. Attractions on this route includes Little Church (described as church that can seat thousands, but only six at a time), Horsethief canyon look out, Bierot Ferry, Orkney Hill Lookout . You may have to buy some carryout for lunch from downtown. If time permits , one can visit some of the other downtown Drumheller attractions like Badlands Historical Centre, Reptile world, Homestead Antique Museum, Fossil World etc. Stay the night at Drumheller. Return back to Calgary, if on a day trip . B. Day 2 - Drumheller to Brooks ~ 160 km. Next morning, continue to go east on Hwy 10, and visit the town of Rosedale and walk the Suspension Bridge.The bridge was once used by miners to access the Star Mine on the other side of the Red Deer river. Continue 16 km east of Drumheller on the Hoodoo Trail (Hwy 10) to reach the Hoodoos(GPS coordinate- 51.380417,-112.534976) . 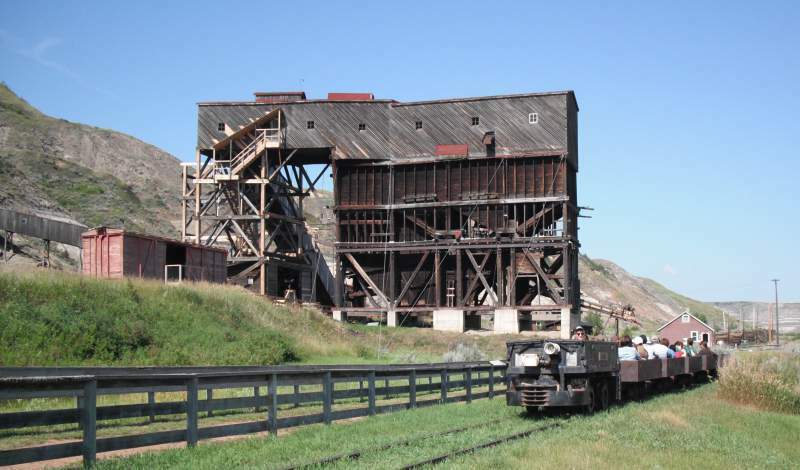 After hiking around Hoodoos, continue on highway 10 for about 9 km and reach Atlas Coal Mine (51.330504,-112.481647), a national historic Site. Visit the East Coulee School Museum. Continue south east on AB 570E for approximately 15 km and one will reach Dorothy, a little ghost town with an old wooden grain elevator. Continue to Brooks,and plan to have lunch there. After lunch, see the concrete hulk of Brooks Aqueduct (coordinate :50.5289, -111.855) – a National Historic site, which spans a 3.2 km wide valley suspending a concrete sling twenty metres above the land.It is located 8 km southeast of the town of Brooks, off Trans-Canada Highway 1. The last stop of the day is Kinbrook Island Provincial Park on Lake Newell, which is 17km south of Brooks. This is an all in one park -Swimming, boating,sailing, Canoeing/kayaking,fishing, birding, sandy beaches and camping . Spend some time at the beach. Retire for the day at Brooks. If planning for two days, skip seeing the other downtown attractions at Drumheller, continue on Hoodoos trail, visit the Hoodoos and spend the night at Brooks. Dinosaur Provincial Park is ~ 50 km north east of Brooks. Reach the visitor centre by 8.30/9.00 am, which displays the parks natural history, dinosaur skeletons and a documentary. To make the best of one’s time, take one of the guided tours (best to book online). Take the Explorer’s Bus Tour which is a two hours tour and Palaeo Puzzlers (1 ¼ hours )/ Fossil Safari (2 hours) if travelling with kids. Another option is to hike the Coulee Viewpoint Trail and the Cotton wood flats trail on your own. By 3.00 pm/4.00 pm start back to Calgary. Spend two days in Dinosaur Provincial park. Start early from Calgary so as to reach the Dinosaur Visitor Centre when it opens at 8.30 am/9.00 am. Do one of the difficult guided tours like Deadlodge Canyon Expedition(7 hrs) or Guided Excavation Single Day (7hrs). Camp at Dinosaur Campground. OR – Take time to see the Brooks Aqueduct and/ or Kinbrook Island Provincial Park. Stay in Brooks. The next day, take it easy and do the Explorer’s Bus Tour and visitor centre attractions. Also hike the Coulee Viewpoint Trail and the Cotton wood flats trail on your own. Return to Calgary in the evening. Leave a comment if any web links are redirecting to a non-existing page.